Julien Baker’s sophomore album exists as a valiant storytelling of pain, self-contempt, and anxiety including the many unsuccessful attempts to escape it. I discovered Julien Baker through an NPR segment back in spring 2015. After initially hearing her haunting vocals and raw acoustic sound, I knew I had to investigate more. I searched throughout my usual channels including Spotify, social media, and eventually YouTube. Simplicity and sincerity are the two qualities that attract me to musicians above everything else. To me, art should be honest and the honesty loses its enchantment the more flash, pop, and bang you add to it. 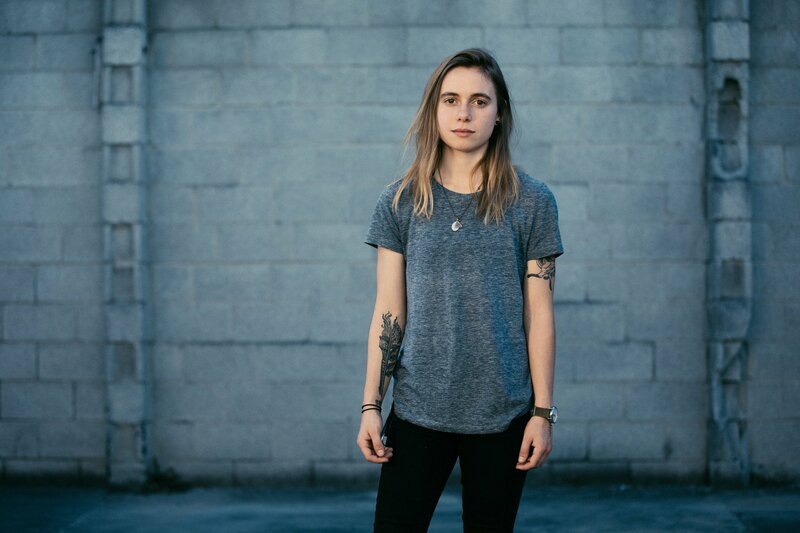 Julien Baker can create a flash, pop, and bang singing in an empty parking lot wearing a flannel while being filmed by a handheld camcorder – and yes I’m referring to a video that actually exists. Her independently filmed video for “Something” embraces all the reasons why I feel this Memphis-born songwriter is an artist for the ages. Her debut album, Sprained Ankle, appeared near the end of 2015. Her ballads about heartbreak stir souls and wake spirits; each more breathtaking than the last. Out via Matador Records, Baker’s sophomore record Turn Out the Lights arrived ready to overpass its wistful predecessor. Turn Out the Lights opens with the instrumental track “Over.” We hear doors closing, footsteps moving closer, and piano keys reverberate their way into the space; it’s as if we entered a room alone with Baker and she’s ready to tell her story from beginning to end without interruption. It’s our 1:28 long moment to prepare for aches and confrontation ahead of us. “Over” fades fluidly into the first single off the album “Appointments,” a tale of disappointing friends and wrestling with self-loathing. Many of the tracks on this album express Baker’s feelings of outcast and difference. “Appointments” serves as our introduction to the theme that will urge us to offer help and itch for a glimpse of hope. Turn Out the Lights in all it’s beauty is a hard listen – it’s courageous, depressing, and necessary. “Turn Out the Lights” depicts a conversation with herself late at night in the bedroom. It’s the moment when your room goes dark and you’re left all alone with your thoughts. The regretful, hateful insomnia sets in and yanks Baker out of a dream. “Myself” begs for comfort and sleep, but “me” doesn’t let go until she remembers all of her faults and failures. Turn Out the Lights doesn’t include a single song that conforms to the traditional song structure of verse, chorus, and bridge. Baker thinks out loud which doesn’t always look pretty or uniform. Her thoughts scramble and resettle into free verse poems rich with metaphors and eye-opening imagery. “Sour Breath” includes one of my favorite lyrical passages. Many people build homes within lovers that glisten from viewpoint of the elegant front door but splinter behind the curtains. Baker yearns for this connection but feels that her partner dreads her presence. The trauma of opening your heart to another who consistently makes you feel less than your worth damages the psyche. The relationship embodied in “Sour Breath” feels like the catalyst for the entirety of Turn Out the Lights; it ignites self-deprecation and encourages the person to feel the blame on their backs instead of launching it towards the true transgressor. “Televangelist” and “Everything That Helps You Sleep” echo with Christian symbols and her roots in spirituality. She mentions crucifixes, cathedrals, and the Holy ghost. With the addition of piano and even organs, Baker designs modern day hymns for both the spiritual and spiritless. The addition of this style of imagery surprised but didn’t turn me off of Baker. It seems to undertone her feelings in a new light that would not have been achieved without the desperate aching towards a greater power to aide her in her quest to find a new Julien. “Happy to Be Here” and “Hurt Less” show us that Baker has been dealing with tough introspection for years. In “Happy to Be Here” she requests new circuitry and questions how the creator could’ve made such a mistake. Baker drops hints of attempting to alleviate her pain through drugs, cigarettes, and alcohol, but we soon realize these outlets haven’t alleviated anything. Overall, Julien Baker’s second album shimmers with an overcast beauty across a calm lake of sadness. Some of her stories were harder to follow this time. Her run-on sentences felt familiar but caused the messages to be less accessible to the listener. By the end, I felt a bit hopeless in my endeavor to help this poor soul. In all their beauty, many of the tracks and sentiments felt redundant by the time I reached “Claws in Your Back.” Nevertheless, her lyricism is unparalleled; Turn Out the Lights includes breathtaking imagery and harsh realizations every person has as they come of age. Julien Baker’s sophomore album exists as a valiant storytelling of pain, self-contempt, and anxiety including the many unsuccessful attempts to escape it.